From daily brushing or styling, hair can become fine, fragile, dull or rough with split ends. 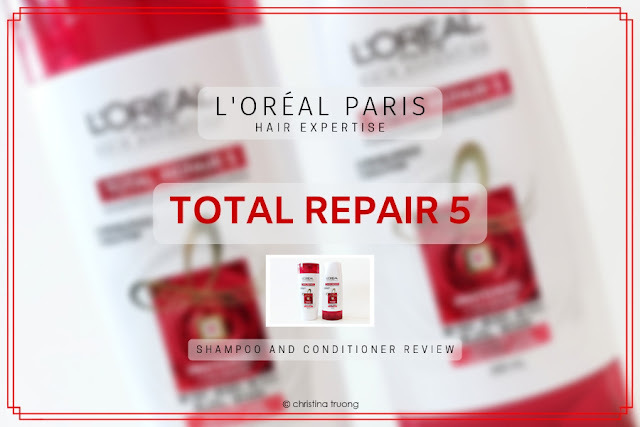 L'Oreal TOTAL REPAIR 5 helps repair 5 signs of damaged hair. With protein, the TOTAL REPAIR 5 shampoo and conditioner restores protection to the hair’s surface, leaving it soft to the touch with a healthy-looking shine. Although I take care of my hair and it's at a healthy state, I use heated hair tools almost daily, so my hair can get pretty damaging without it being visible. I am always on the lookout for solutions to help prevent the damage from going further than it needs to be. I mean, the best thing I could do for my hair is to not use any heated tools and styling products but that's a bit impossible in my books. Luckily there are products out there, such as TOTAL REPAIR 5, that can provide a bit of hair help, even when the damage is done. Apply TOTAL REPAIR 5 Shampoo on wet hair, lather and rinse. Follow with TOTAL REPAIR 5 Conditioner, leave in for 1-3 minutes, then rinse. For extra care, follow with the TOTAL REPAIR 5 CICA CREME Treatment. The TOTAL REPAIR 5 Shampoo has a not-too-runny consistency and the scent is lightly sweet but delightful. The shampoo lathered well into the hair and easily rinsed off. My hair felt cleansed before going into conditioner. After shampooing, I follow up with the TOTAL REPAIR 5 Conditioner. The conditioner's consistency is a little thicker than the shampoo but the scent is similar in which it's sweet but not overpowering. The conditioner lathered nicely and after leaving the conditioner on for about 3 minutes, it rinsed off easily. It did a great job at conditioning my hair and in the end, my hair is left feeling and looking a bit more soft and shiny. What are your thoughts on TOTAL REPAIR 5? Disclaimer: Products complimentary from Topbox Circle for review purposes. Views expressed are honest and of my own.